that lamu cat is very handsome! :-) but emmy wins as usual for sheer cuteness. awww they're adorable. I love kitties. 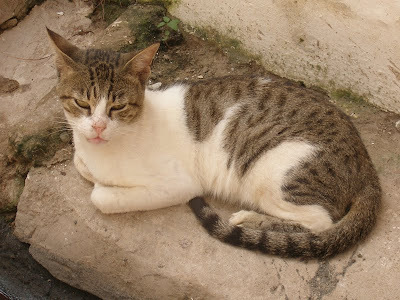 the lamu cat is cute but looked rather grumpy. And Emmy, as usual, is adorable! Ooh, a Lamu cat! I have a gorgeous book about them- fascinating. I never get tired of kitty pics. LOVE them. The first catlooks like Allie. Your cats are too cute, who is going to watch them when you come home for Christmas. We need lists for you and Daniel. Emmy looks like she is super comfortable in that blanket! The lamu cat is very pretty as well. Emmy is cuter than that Lamu cat! and Bandit is cuter than them both! That lamu cat has a different shaped head than the ones that I see around here!! Emmy has the right idea! Kitty pics always put a smile on my face. Thanks, Lenore! We have an award for you! 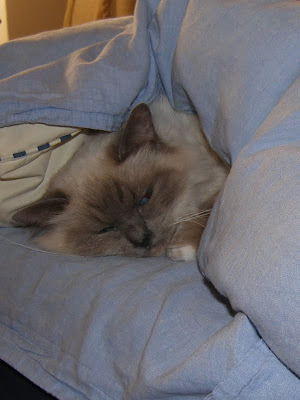 Awww, that is such a great pic of Emmy all snuggled in. It's getting really cold here now. Buddy crawls under the covers at night and lays close to the heating pad even though he's so furry. Gotta love Emily! The Lamu cat looks a bit too skinny to me. Or maybe my own cat is a bit on the plump side, lol. Double kitty post! Both are cuties.